With the increase price of train and tube tickets annually in January, and with the addition this year of the VAT Increase from 17.5% to 20%, I thought it would be time well spent to work out the cheapest method of travel for getting to work. So I calculated the cost, based on the costs which I had experienced in the past 7 months, and including things like insurance and petrol, verses the two options I have with the train system, which is either pay as you go or monthly travelcard. At this point I ruled out a yearly travelcard. I also took into account how many working days there were per month including public holidays and any possible holiday I might take, e.g. a week in August. There are a couple of immediate observations. 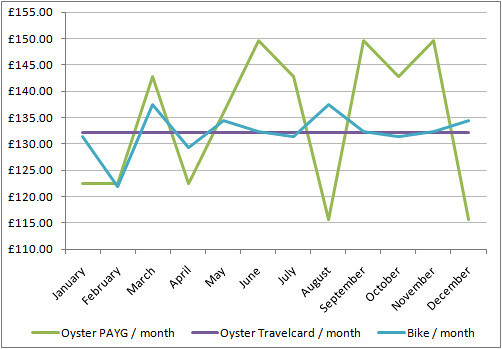 The most obvious is that the fixed monthly cost of the Oyster travelcard (in purple). This can act as our standard cost throughout the year. The other costs, unlike the monthly travelcard, are affected by the number of days in the month. The motorcycle costs are also affected by a set amount per month, so even if I don’t use it it’s still going to cost me. Whereas the pay as you go (PAYG) travelcard from Oyster means that I only actually pay for that journey. No other overheads. So, when there are a low number of working days in the month, the motorcycle and PAYG win. When there are a high number of working days in the month the monthly travelcard wins. So, what this actually tells me is that for three months of the year the bike is cheaper, for four months of the year the PAYG is cheaper, and for the rest of the time, the travelcard is the cheapest. 3,4,5. The difference now is clear, but of course it’s biased. So taking into account my calculations for petrol cost, insurance and maintenance, travelcard and PAYG costs, there are still a couple of big exceptions if you’re looking to do the same. I’ve been riding for under a year which puts the price of insurance up quite a lot, as i get older and more experienced, gain more no claims bonus’, the cost of motorcycle insurance should decrease. My bike is carboretta fueled bike, as opposed to fuel injection, which means it’s less efficent than newer bikes. The current MPG is about 40. I don’t have to clean a travel card. I’m travelling between zones 2 and 6, and if my journey was any further or from outside of London then the train price would go up.